Ratatouille is one of if not my favorite animated movie ever. What's not to love about a movie featuring a rat in the kitchen?!? Once you get past that part (and for some people it IS a sticky point), you will discover a beautiful movie starring one little rat and one young male kitchen employee. You will combine three of my and possibly your favorite hobbies ~~ movies, food and travel. You will enjoy the sights and sounds of the city of lights, Paris. For more information about the movie Ratatouille and what the crew had to go through to bring you this delicious animated food movie, visit my Ratatouille movie review by clicking right here. And the blu-ray version of Ratatouille? Well, simply put, it is a delight. High-Def Digest says, "This blu-ray release is also fantastic, boasting absolutely perfect video and audio, plus a great package of extras. This is a must-own disc that no Blu-ray collection should be without." 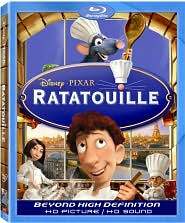 Click here to order your copy of Ratatouille from Amazon.